Agathe de Bailliencourt presents Sky Window Outline, a site-specific installation created for Beppu during her time in the city. Sky Window Outline does not have one single point of view but a plurality of point of views; the artwork opens a perspective in the city of Beppu, an opportunity for imagination, a time observation and reflection. Agathe de Bailliencourt seeks to create an "open perspective", a situation, an environment that is opened to the visitor. Born in 1974 in France, she currently lives in Berlin. She works on canvas, paper, and directly onto space, architecture and nature. She has been working on landscape since 2011. Her latest body of work deals with the classic question of horizon, as one of painting's most traditional acts in defining time, space, and a scale of infinity. Aili Zhang lift the veil on the new artwork she created for Beppu. From natural material, such as some branches of tree or leaves that she has founded in Beppu, Aili Zhang has composed an image on a wall of the city. The dynamic and pre-existing shape of the material confer a magical aspect to the artwork, as if the artwork was composed by itself. This artwork, that uses natural elements as a tool for creating images, offer a view that mysteriously appears in front of our eyes in a sensitive composition by the artist. Born in 1988 in China, she resides in The Netherlands. She has studied traditional Chinese painting, called Gongbi, during her childhood and later she started to be interested in abstract ink painting. She is now extending her art to visual art installations using other material than paint. However the installations she creates recall vividly her brushstrokes. For the international artist in residence program「KASHIMA 2014」we have selected two artists between 374 projects: Agathe de Bailliencourt, from France and Aili Zhang, from China. New artworks emerge in Beppu city in unexpected places, at the corner of a street or in a narrow path. The encounter with the artwork is a surprise and also a chance to explore the secret sides of Beppu. 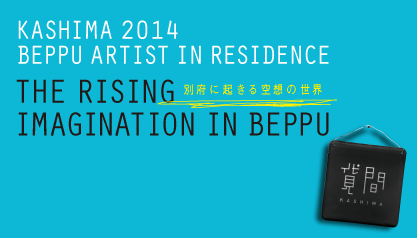 "KASHIMA BEPPU ARTIST IN RESIDENCE" is a residence program that BEPPU PROJECT hold in Beppu since 2008. In Japanese, "kashima" refers to the name of the accommodation visitors stay when they come to heal themselves in Beppu's hot-springs. This program aims at providing an opportunity for artists, in connection with a new environment and the local community, to create and promote their art and culture.